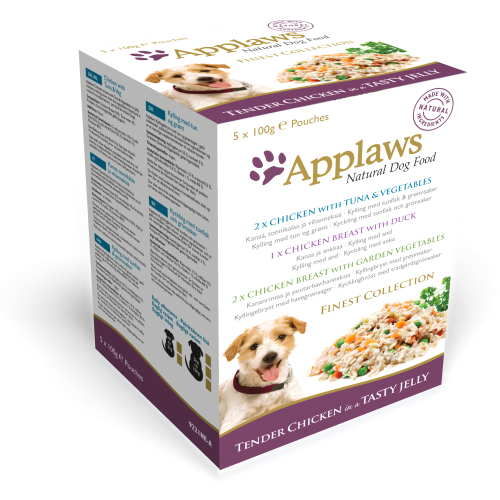 Applaws Finest Collection Tender Chicken in a Tasty Jelly multi-pack contains a great selection of complementary wet food, perfect for keeping your pooch going throughout the day! Applaws dog food is completely natural, with flavours especially developed to give your dog a healthy and scrummy meal. Each pouch is low in carbohydrates, but rich in natural meat protein which helps with growth and repair in your dog. Your dog is sure to love the scrumptious flavours that are available in this multi-pack, which are: Chicken with Tuna and Vegetables, Chicken Breast with Duck and Chicken Breast with Garden Vegetables. 2 x Chicken, Tuna, Vegetables. Applaws chicken breast with tuna and vegetables in jelly. Chicken breast 55%, Tuna meat 3%, Pumpkin, Carrot, and Vegetable gelling agent. No additives. Applaws chicken breast with duck in jelly. Chicken breast 55%, Duck 7% and Vegetable gelling agent. No additives. Applaws chicken breast with garden vegetables in jelly. Chicken breast 55%, Pumpkin, Carrot, Green pea and Vegetable gelling agent. No additives.